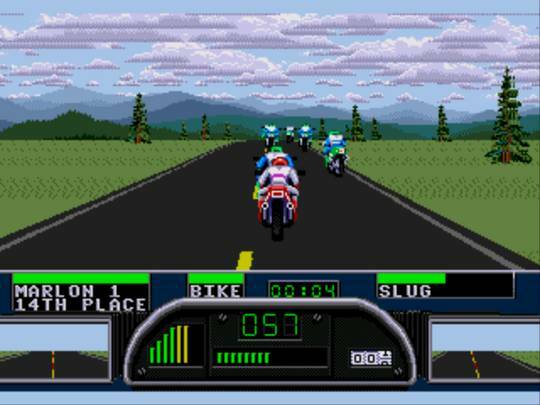 Road Rash II is a vehicular combat racing game and the follow-up to 1991's Sega Mega Drive / Genesis original. There's five difficulty levels that consist of five races each; the objective is to place third or better in each race to win cash, upgrade your bike and move on to the higher levels. While racing, you can attack opponents with punches, kicks or weapons such as a chain or club. The gameplay feels more grind heavy than the original in that you really need a decent bike to succeed, something the game makes you work hard for. The difficulty ramps up extremely quickly too (e.g. by Level 2) and what doesn't help is the overabundance of roadkill and animals that litter the road to an annoying degree! The frame-rate is also an issue, as while it seems faster than the original it's still very low; it's not a huge problem in solo mode, but two-player split-screen is an uncontrollable abomination! My main gripe is with the actual tracks themselves, as while locations such as Hawaii and Alaska have a lot of potential there's barely any scenery here, and what you see at the start of a race is what you'll see on repeat for the next few minutes; compare this to Outrun (1986, Arcades) and the difference is night and day. Still, the actual racing is just as entertaining as ever, and there's many hilarious, yet panic inducing moments, such as when you launch off a hill and find yourself manically steering to avoid a collision! Also, the nitrous bikes are a fantastic addition and while they might sound overpowered you really have to use them wisely, otherwise you'll quickly be spinning out of control! There's some humorous cut-scenes after each race, but the music stumbles by replacing hard rock with soft honky tonk / blues tracks. If you enjoyed the original game you'll love Road Rash II and might even get some amusement out of its flawed simultaneous two-player mode. It does feel like an expansion pack rather than a full-fledged sequel, but it still features high-octane racing and offers a greater challenge to series veterans looking for more of the same. Random trivia: A port for the Sega Game Gear was planned for release in 1994, but was ultimately cancelled.